It was completely dark. The only things visible now were the two small beacon fires on Pinta and the Niña. Christopher was glad the two fires calmed his frightened crew. They calmed him, too. Their glow reminded him that the Santa Maria was not alone on the vast, uncharted Ocean Sea. The three ships would sail together into the unknown. 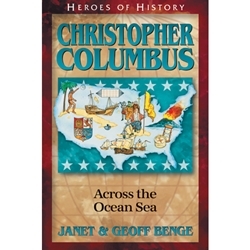 Buoyant and determined, and having at last won the support of the king and queen of Spain, Christopher Columbus sailed west from Europe with three ships, confident he would reach the Indies by this new route and find the gold-laden civilization of the great khan.